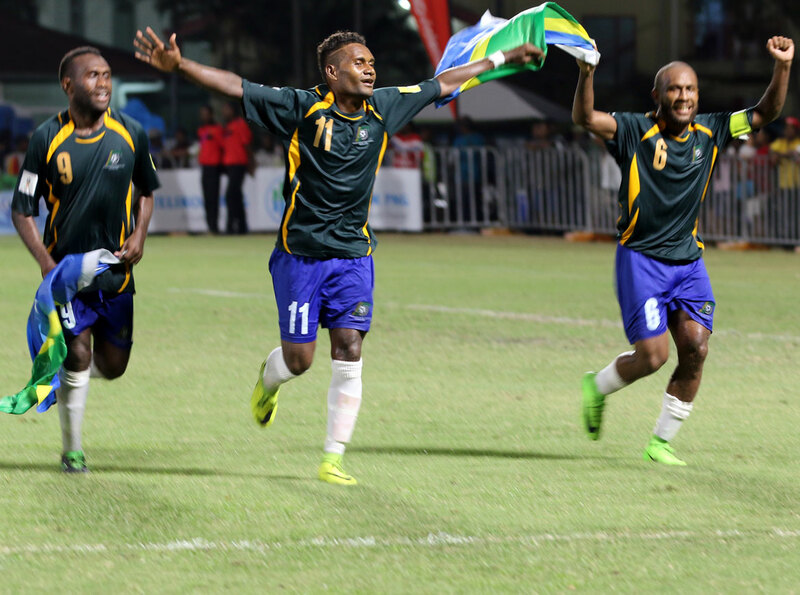 Solomon Islands celebrate their victory in Port Moresby. The Solomon Islands left everything on the pitch this evening as they secured a narrow 2-1 victory over Papua New Guinea at PNG Football Stadium in Port Moresby to keep their 2018 FIFA World Cup Russia™ Qualifier – OFC Stage 3 campaign alive. This win, combined with the 3-2 victory in Honiara on Friday, ensure Solomon Islands top Group B which sends them off to meet OFC Nations Cup holders New Zealand in the home-and-away series final. It’s the first time in 12 years the Solomon Islands have qualified for the play-off final and it’s a moment captain Henry Fa’arodo wanted to relish. “You know, the loss to Papua New Guinea in the semi-finals of the Nations Cup was a year ago and today I feel like we have rid ourselves of that memory,” the Solomon Islands skipper said. “As we expected, it wasn’t an easy match out there. Papua New Guinea is an incredibly good side and they really put us under pressure. A big shift was required from both sides as they both required results to knock Tahiti out of contention for the final play-off. The challenge was harder for Papua New Guinea who needed to overcome a large margin to stay in the running, and when talismanic striker Raymond Gunemba capitalised on a defensive error to send his side into the lead, it seemed a good sign. However the celebrations were short-lived as defender Felix Komolong was dismissed in the 30th minute for a handball, and Fa’arodo equalised from the resulting penalty. A stunning effort from Jerry Donga in the closing minute of the first half proved to be the winner, his precision placement putting the ball out of goalkeeper Ronald Warisan’s reach. Although a man down, Papua New Guinea proved they are a resilient, determined bunch of young men. They kept the pressure up on their opponents to dominate periods of the second half making inroads into the opposing final third and coming very close to securing an equaliser. Papua New Guinea coach Flemming Serritslev said the red card was very much the turning point in the encounter. “I’m very proud of the team but I’m not proud that it’s the second time in-a-row, in home matches, we’ve had the match spoiled by a very unfair decision from the referees,” he said. “It’s really tough to have to play more than 60 minutes with only ten players. “I cannot blame the boys for anything at all. They really did their best and dominated the second half totally with ten men. What more can I demand from them? I cannot demand more,” he continued. On the other side of the result, Solomon Islands coach Felipe Vega Arango Alonso was experiencing much different emotions. “I am really happy and I am really happy because I know how hard these guys have worked. They deserve,” he said. “The game was not easy, I knew, and at the beginning once again we make a little mistake and they scored an early goal. “But we kept it together. They tried hard, they fought and we were a bit lucky with the expulsion of the player because against ten things are a little bit easier. Vega Arango Alonso said after his side scored the second goal they opted not to take too many risks which resulted in a much more defensive approach to the second half. Solomon Islands’ win ended the 2018 FIFA World Cup Russia™ Qualifying campaigns for both Papua New Guinea and Tahiti in one hit, and they will now prepare for the Stage 3 final against New Zealand. The draw for the home-and-away series will be held on Thursday 15 June at 4pm in Auckland, New Zealand.